Good morning, friends. I should be doing a million other things right now, but woke up feeling a little lonely. So I'm here instead. And with not much to say except that sometimes, even if everything else seems dull and gray (right, Seattleites? ), the colors on our plate offer themselves as a reminder of all the riotous bounty in the world. It could have been that all fruit was khaki-colored, and all vegetables were white. Or that we take a pill every morning for the day's nourishment. 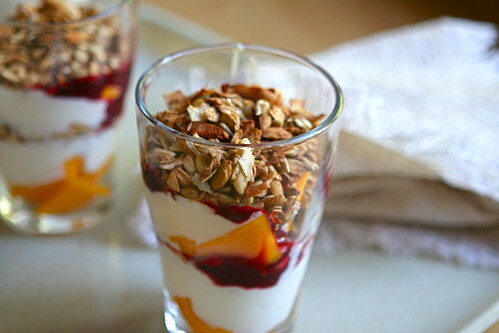 Instead, it's this--orange mango chunks in the bottom of a glass, a dallop of yogurt. Then jam or fruit sauce--in my case, mushy plums that I cooked down and put through a food mill. Then some crunchy granola. Now, all four layers again. Or maybe you've got berries, some early apples, pineapple or cantaloupe, nectarines or peaches. Anything will do. Stick your spoon in--you might be the stirring type or the keep-it-in-layers type. I'm the latter. Whatever the day holds, at least there is this bright, sweet sustenance.